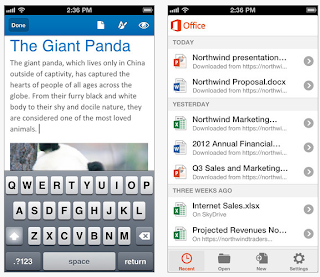 iOS: Microsoft Office Mobile for Office 365 quietly landed the iTunes App Store this morning. It’s Microsoft’s first Office product for iOS, and while right now it’s iPhone only, if you have an Office 365 subscription, it’s worth a download if you want quick access to your SkyDrive and cloud-hosted Word, Excel, and PowerPoint files on the go or offline. Office Mobile gives you access to all of your SkyDrive, SkyDrive Pro, or SharePoint-stored Word, Excel, and PowerPoint documents. You can open them, view them, edit them, add comments to existing documents that have been shared with you, and even create new documents and get to work—-presumably on your iPhone, since the iPad version of the app isn’t available yet (although you could always expand the iPhone version to 2x and work that way). Documents you’ve recently edited on your desktop float to the top, and you can search your account for others. The app even supports offline editing, so you can work if you’re on a plane or without an internet connection. You do have to have an active Office 365 subscription in order to use the app, but the app itself is free. Hit the link below to grab it, or head to The Microsoft Office Blog to read more.